Since the Rim Fire in 2013, many campers and The Friends of Berkeley Tuolumne Camp, along with City of Berkeley staff, have been working tirelessly to rebuild camp. We are now at the crossroads of this effort! We have just been informed that on Tues April 4th 5:30pm, at a special worksession on Camp Tuolumne, the City Council will be making a critical decision to set aside City funds in the FY 18-19 budget to help pay for the next phase – the design and reconstruction of camp. A YES vote means we stay on track, with design and reviews in 2018, construction starting in 2019 and finishing in 2020, and Camp could be open as early as summer 2021. A NO vote means the project gets delayed, the City prioritizes other needs and we come back to appeal for funds in a year and camp is further away from reality. The city is negotiating with insurers, FEMA and the state of California for funds that will pay over 90 percent of the estimated $60 million cost to rebuild camp. The federal government requires the city to pay a small share of the total cost; this share is estimated to be about $3 – $5 million. To get the camp rebuilding process going in 2018 – 2019, the city needs to invest for design and some initial construction. If the city makes this investment, then we are well on our way to having camp reopen by 2021! 1. Activate All Campers! Ask all Campers you know to get on the FOBTC Distribution List. We need to gather as many campers in our database, so we can activate our community when needed. 2. Write and/or Call Your Council Member: Find contact info for your council member HERE: Tell them how much camp means to you and how important and imperative it is to you that camp be rebuilt ASAP. The more council members hear from their constituents, the more they’ll feel compelled to support camp! They MUST feel how much support there is for Camp. If you live outside Berkeley, please send an email to the entire City Council at council@cityofberkeley.info. 3. April 4th 5:30pm Attend the City Council Meeting! We must show up at this meeting! This is IT! The critical moment for camp. Please bring as many friends and family as you can to this event. It is imperative that we pack the house, to demonstrate our passion and commitment to the new Council. This is our opportunity to stay on track and take one critical step closer to being back by the river…with a gorgeous new camp! and we’ll see you at the City Council Meeting! Calling All Campers! Its a Friend-Raiser! It’s a FRIEND-RAISER! We need your Help! We are trying to connect with any and all campers to be able to update, activate and mobilize our community as the City of Berkeley will be voting in June on their next 2 years’ budget… which is crucial for camp’s rebuilding process. We know YOU are getting our messages, but we want to make sure EVERYONE who cares about camp is included. This is the time where campers can really help camp! Thank you! We will be sending out an action plan shortly so you can plan on how to help! We need to make sure the new Mayor and new Council know how many people love Camp Tuolumne as they decide on their 2018-2019 budget. Hi Friends – for those of you who missed the City Council Mtg, here is the update to the City Council and Mayor on the status of all 3 of the city’s Camps. 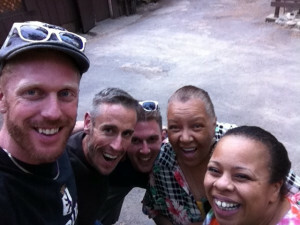 Hi Campers, Staff and Friends! 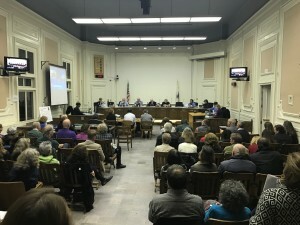 On Tues Nov 29th, 2016, the Parks, Recreation, and Waterfront division gave the City of Berkeley Council Members a full report on the progress and current status of their Camps division, as the City Council and Mayor get ready to make important decisions on the allocation of funds towards various needs and infrastructure projects. The Council Chambers were completely filled with Camp families and staff, overwhelming the space with standing room only supporters stretching out into the hallways. The Council were visibly moved by the support, and the testimony on how important Camp Tuolumne, Echo Lake and Cazadero Camps are to the citizens of Berkeley. Two-thirds or more of the attendees were there for Camp Tuolumne. The Friends of Berkeley Tuolumne Camp were given a seat at the staff table and Richard Thomason, a Berkeley resident and FOBTC Board Member, spoke on behalf of the campers and our organization. We promise to keep on fighting for the rebuilding of Camp as a high priority in the City of Berkeley as they near their budgetary decisions. The Mayor and Council were VERY supportive and said they will do everything they can to rebuild Camp as quickly as possible. We have planned meetings with every new council member, and the new Mayor, coming up. I’m Richard Thomason, a board member of Friends of Berkeley Tuolumne Camp and a 23-year resident of District 5. 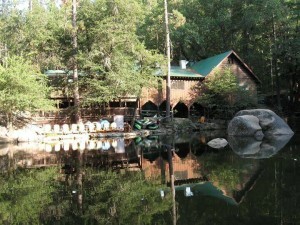 For 12 years, our family attended Tuolumne Camp for a week every summer with our Berkeley friends. In 2013, we evacuated out of camp ahead of the Rim Fire as ashes were falling out of the sky. Our whole family was devastated at the loss of camp. Every summer, we had a magical week where we could connect with nature, unplug from work, spend time with friends and family, and let our kids run around in the woods with little supervision. I can’t tell you how important it was to my girls that we could let them have the gift of unstructured time at camp. Our girls learned so much there about independence, self-reliance, and community. 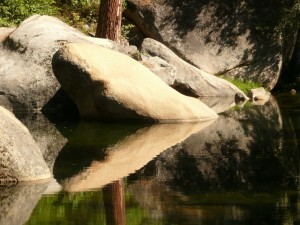 The Friends of Berkeley Tuolumne Camp (or FOBTC) was founded in 1984 to advocate on behalf of Tuolumne Camp. We were formed in response to plans to build a huge dam on the site of Camp, which would have flooded it under hundreds of feet of water. Working closely with hunters, environmentalists, the Tuolumne River Trust and other allies, we defeated plans for the dam and saved Tuolumne Camp. We represent thousands of campers and staff, including hundreds of Berkeley households, spanning many generations of involvement over the 100-year history of camp. We are united in one goal – to help rebuild camp so that future generations of Berkeley kids can have the same formative experiences at camp that my children had. Over the years, FOBTC has contributed tens of thousands of dollars to upgrade both Tuolumne Camp and Echo Lake Camp; has donated countless hours of volunteer labor to make improvements at camp; and has paid for the all-staff dinner at the end of the summer to promote staff morale. We’ve also worked hard to keep the Tuolumne Camp traditions and community alive locally since the fire by hosting fundraisers, campfires, and meetings where Berkeley residents received updates on the rebuilding process from the Forest Service and the City. To support and lead a capital campaign to help raise money from the community for the rebuild effort. 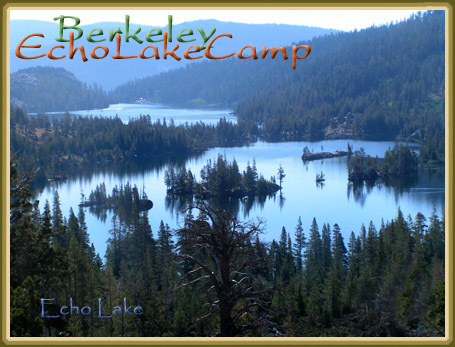 To help the city plan for future use of Echo Lake and Tuolumne camps to best serve all the diverse residents of Berkeley. And to continue to advocate for Tuolumne Camp to the US Forest Service and all the government agencies involved in the rebuilding process. We want Tuolumne Camp to once again be that special place where Berkeley residents of all ages and all backgrounds can come together to create community in nature. We want camp again to be a place where Berkeley youth can have their first real jobs and learn valuable work and life skills. So FOBTC stands ready to partner with you and city staff to rebuild camp as soon as possible. To that end, we’d also be delighted to organize a tour of the camp site for councilmembers who haven’t seen it, including the new incoming members of the City Council. Thank you for your time. Soon the Berkeley City Council will start making some critical decisions about rebuilding camp. At this work session, the City Council will get a report from city staff about the progress being made in negotiating an insurance settlement to help pay for rebuilding camp and in getting the permits and plans needed. City staff will talk about the timeline for rebuilding camp, and there will be time for public comment. We as campers and stakeholders need to show enthusiastic and vocal support for the project (rebuilding camp as quickly as possible). The City Council won’t take any action at the work session, but will ask questions and take public comment. This will be the first time that we can show the Council the passion in the Tuolumne Camp community. Can you PLEASE help us get as many campers (kids welcome) to this Council Meeting?!!! Please save the date, and bring friends! It is vital for us to show the council that Camp is a beloved part of Berkeley and a priority for allocating funds towards. We are asking for families and campers to come to this one hour meeting and show our community support for Camp. Please mark your calendar to attend the Berkeley City Council work session on Tuesday, November 29th at 5:30pm. In the coming months, are you willing to contact Berkeley City Councilmembers and let them know what camp means to you, and that you want the city to rebuild camp? We want to make sure the councilmembers continue to hear about the importance of camp. You can write them directly at council@CityofBerkeley.info. Thank you and see you there! Wear your Camp Shirts! The Friends of Berkeley Tuolumne Camp continue the decades old tradition of planning and hosting a special Labor Day weekend at Camp! Last year, the weekend was amazing with 86 degree sunny days and warm nights! Please make your reservation early. Special activities include arts and crafts, boating, swimming, volleyball, campfires, hosted Happy Hour every night on the observation deck, family bingo with amazing prizes, archery, and lots more! All tents are a minimum of 2 people. Dorm Rooms: We hold the largest, double size tents (fits 12) for single occupant campers. 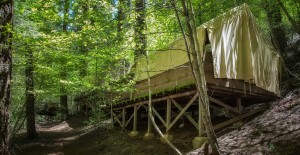 This keeps individual campers from having to pay an extra $200 fee for their own tent. Single occupants may choose to a tent with friends, book a tent for an extra $200 or stay in one of the Men’s or Women’s Dorm Rooms. The Friends of Berkeley Tuolumne Camp (FOBTC) are dedicated to preserving and enhancing the camp experience for present and future generations through education, volunteer efforts and financial support. Rates include Friday dinner through Monday breakfast or any part therein. 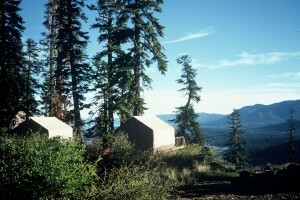 Two person minimum per tent. The Friends of Berkeley Tuolumne Camp raises money to enhance the camp experience through advocacy and programming like the annual staff appreciation dinner. Please consider a gift with your camp registration. Check-out is 11:00 am Monday. No refunds 30 days prior to Labor Day Weekend. Reservations will be confirmed by email. Please make sure your email is correct if you would like a camp reservation confirmation. Single Occupant – individuals wishing to attend alone may register to stay in our Men’s Dorm or Women’s Dorm with other individual campers at a reduced rate. we honor this date of Aug 25th. Come out and join family, friends and former staff at Live Oak Park in Berkeley for a campfire and s’mores. Led by former Nature Center founder and Campfire Leader Janet Sowers, along with former Rec staff, we’ll be singing old camp songs, roasting marshmallows, and enjoying a little “camp” in Berkeley! Bring a lawn chair, pillow, and dinner/snack if you like. We’ll bring hot cocoa, marshmallows, graham crackers, chocolate and all your favorite Tuolumne Camp songs. Also, if you have a guitar please join us in singing folk songs, Beatles, Dylan, or whatever you’d like to bring! We hope these opportunities to stay connected to Camp and fellow campers, in this rebuilding phase, will keep our community strong and inspired to continue the Tuolumne Traditions for years to come. We must keep singing our songs. 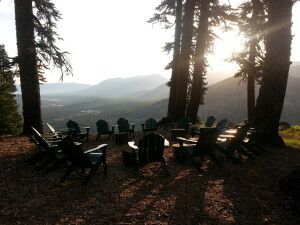 Echo Lake Family Camp began last Saturday and is off and running with 80 degree sunshine and amazingly beautiful days! This year’s staff is AMAZING! A great balance of long time staff leaders and some great, new people just starting their staff experience – and everyone is having a blast together. They carry the Camp Spirit and traditions so seamlessly into the summer time. This bodes perfectly well for our future. Camp was almost completely filled the first week, and the rest of the summer has only a few spots open – which is great testimony to a fantastic job by Craig and the City Staff, as well as our camping community that loves to be at Family Camp! In my conversations, I was SO excited to see returning 1st week families, as well as a majority of NEW first time families! They “just moved to Berkeley”, “just heard about the camp”, “found it online”, “neighbors told them about it”, etc… all just starting, just beginning their own family camping traditions, and having a great time! With young kids as well as grandparents in tow!It felt like a birth. A new beginning. It filled my heart. A great beginning to the summer….. congrats to Craig and his staff! The Recap of Camp Tuolumne Night at The Freight! Hi Campers and Friends… last Monday night we hosted our 3rd annual Camp Update Night at The Freight & Salvage Coffeehouse in Berkeley, and we are so grateful to the Freight for hosting us! Our efforts, as always, are to continue to bring the Camp Community as much up to date information, involvement and participation as possible. We were honored to present the latest on The Rim Fire Recovery efforts and the Reforestation Plan, as well as the latest from The Tuolumne River Trust and the City of Berkeley. It was a fun and spirited group that came – almost 150 people – who all brought great Camp Spirit with them and reunited with other campers and staff! Friends of Berkeley Tuolumne Camp Executive Director, Scott Gelfand, and President of the Board, Steve Geahry, welcomed the crowd and introduced the US Forest Service officials. Maria Benech – Reforestation EIS Team Lead – Replanting The Rim Fire Area! The team opened the presentation with an overview of the 2013 Rim Fire and the hard work that the Stanislaus National Forest (SNF) staff are doing to recover timber, remove fuels, restore trails and recreation access areas, and replant the forest. The heart of the presentation involved the new Draft Environmental Impact Statement (DEIS) that the Forest Service has worked hard to produce and present to the public for comments. Maria gave very detailed and thorough explanations and diagrams of the various replanting schemes, with the emphasis being on creating a forest landscape that is more open, has a greater diversity of trees, and will be more resilient to future fires. Scott Tangenberg followed with a sobering account of the damage inflicted by this historic drought and the subsequent infestation of bark beetles. 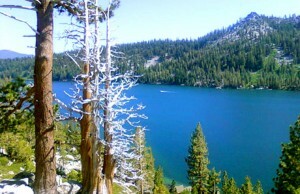 With rather shocking images of brown and dying ponderosa pine trees across the Central Sierra Nevada, Scott showed that just as the Stanislaus National Forest is recovering from the massive ecological disaster of the 2013 Rim Fire, it is now under a fresh assault from drought conditions, and bark beetles killing millions of pines. As pines (particularly the Ponderosas) are stressed and dehydrated due to the last 4 years of severe drought, they have less sap and natural defenses against the beetles. The beetles are able to bore through the bark and eat the living tissue of the trees. The pines’ ability to photosynthesize and and get nutrients down to their root systems; while the roots are unable to get water up to the crowns, and the pines gradually dry up and die. Many areas of the forest are now brown from the dying trees. This is both an ecological disaster, as well as a public safety concern, as falling limbs and trees present a big danger to residents and visitors. The cost of removing the dead trees is massive, and Governor Jerry Brown has declared a State of Emergency, to provide emergency funding to the counties affected. Dusty gave a more hopeful presentation, outlining the many innovative ways that he and his USFS colleagues are educating and engaging the public in the Rim Fire area. He showed his Rim Fire Audio Tour, and played a stirring clip from one of the audio tour stops: BTC. It was very moving to hear an audio clip from the US Forest Service staff, including Groveland District Ranger, Jim Junette, describe how historic and treasured our camp was. Couple with before + after images of 31585 Hardin Flat Road, there were many teary eyes in the room at that point. Dusty also showed off a very cool 360 degree virtual video tour of BTC, with images taken from Cabin 44. Claire then gave an upbeat and funny presentation about the community driven tree planting that is now happening every winter and spring in the Stanislaus National Forest. She showed many fun images of school kids, families, and community volunteers replanting thousands of trees, and she urged the audience to get involved next February, when the narrow window for planting is again open. The Tuolumne River Trust (TRT), led by Seth Connoly, Restoration and Volunteer Coordinator, and Rebecca Stievater, Grants and Events Manager, gave upbeat presentations about the work that they are doing to fundraise, recruit volunteers, lead tree planting days, and offer an exciting line-up of educational and recreational events for the year. Seth gave a presentation on the work TRT, with support from several young AmeriCorps volunteers, is doing to coordinate tree planting trips. Rebecca outlined the many cool events and outings that TRT is offering, which include canoeing trips near La Grange, backpacking trips in Yosemite, concerts at Mountain Sage Nursery in Groveland, film festivals here in the Bay Area, and much more. Denise Brown, Recreation Services Manager, and our favorite Camp Manager, Craig Veramay, then presented the late updates about the rebuilding efforts at 31585 Hardin Flat Road. Denise gave an overview of the complex and exhaustive work the City of Berkeley is doing to a) develop the Master Plan for the site, b) secure a new Special Use Permit from the Forest Service, c) recover insurance settlements and FEMA funds, and d) develop preliminary designs for the new site. Craig gave more detailed slides and descriptions of the many steps in the rebuilding process. His timeline of benchmarks showed the complexity of rebuilding, and the priorities for the City. Craig gave a tentative projection for the reopening of Camp: summer 2020. He showed slides of the early camp designs, describing where certain buildings, facilities and trails will be. Most importantly, the D-Hall will remain in place, overlooking the River, while the Rec Hall (called the River Hall) will be closer to where Boys Camp once was. Camp Staff will now be housed on the other side of the road, opposite Sun City. Sun City itself will be allowed to return to a natural state, to protect the Miwok cultural resources there. Craig closed with a very special presentation of a couple of priceless camp treasures- a photo of the damaged Kitchen Bell, and the recovery of the Activity Bell, which is now safe and sound and rings like it always did! Our very own Executive Director, Scott Gelfand, then drew the raffle tickets for a free stay at our Labor Day Weekend event in Echo Lake Camp. The winner of the raffle was Matt Fitzgerald – who worked on staff in the 90s! As usual- we closed arm in arm with our favorite song, “There’s No Place Like Camp Tuolumne” and a short musical video by a camper, Noel Morrison, of camp in 2011.. just so we remember what to look forward to! Awesome job Noel! 3rd Annual Camp Update! Mon April 25th Freight and Salvage! Hi campers and staff! For the 3rd year in a row, we’re proud to organize an amazing night for everyone who wants to know what is happening with your beloved Camp! We need everyone interested in camp to join us on Mon April 25th at The Freight! Camp Trivia Contest and prizes will be given out! There are lots of questions and we want to pack the house so the officials know we care about Camp being rebuilt! Please reserve your tickets! * What’s the plan for planting trees in the area? * What will Camp look like when it is rebuilt? * What is the projected timeline? * How was the Tuolumne River affected by this drought and the Rim Fire? – whatever you want to ask those who make decisions on that area. PLEASE join us for a GREAT night of camp spirit.